Are you looking for a best construction WordPress themes? If your answer is yes then here is your list ! 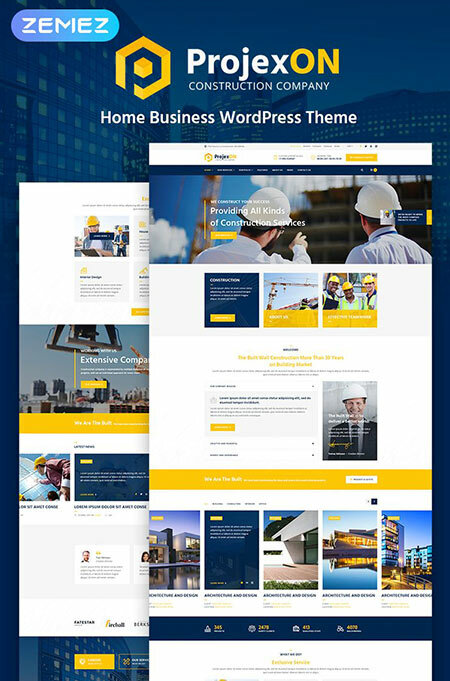 in this post, I listed top best selling and most popular high-quality construction company WordPress themes. I hope this post will help you to get the exact theme for your startup construction business. In this post, I collected every single theme following some requirements that are necessary to build a construction website. So no worry about taking any decision. Those themes are very beautiful, highly professional, stylish, modern themes. You can create any kind of construction website using any of the themes. You have to need just choose the right one. 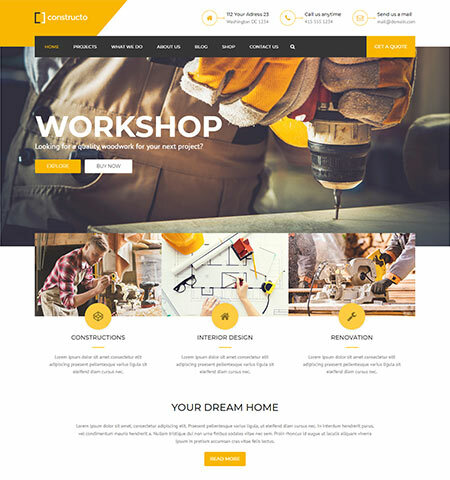 You can a create construction business website, Plumbing website, architect website, interior or exterior design website, writing website, home decor etc there are lots of the category. Every theme has a built-in function with complete requirements. No need any coding skills to customize the theme or manage it. You can customize any of the themes easily from the WordPress editor every theme has drag and drop page builder that gives you much flexibility. Every theme has a complete pre-build demo for different kinds of category. So you won’t have to spend much time on your website. It’s easy to start. Just need one click on to set up a complete demo content with beautiful design. After installing the demo content you have to need to import your own content and image into the site. Design Quality: It’s one of the most important parts of any kind of website. If your website is looking old outdated design then this is not good for the visitor and your repeat clients will be drop ASAP. So you should focus on the design first. All standard Device support: Nowadays most of the visitor visits a website using their smartphone/mobile or any other device like tab, laptop etc. So before choosing any theme, you have to need to check the responsive design. Easy to customize: If your theme is not well coded and not visual design then it’s pretty difficult for you and your visitor. You should check their documentation properly and read every single item about their support and theme features. But in this post, I list every theme following all the above information. So no worry about that. Powerful Admin Panel: A well organized powerful admin panel will give you more flexibility to add, remove, delete anything from your website. Using admin panel you can add an image, video, text anything whatever you want on your website. So it’s more important. $90+ save this theme provides you top 4 premium plugins full free without any single cost. Home Repair is a fully responsive and retina ready contractors and renovation WordPress theme. 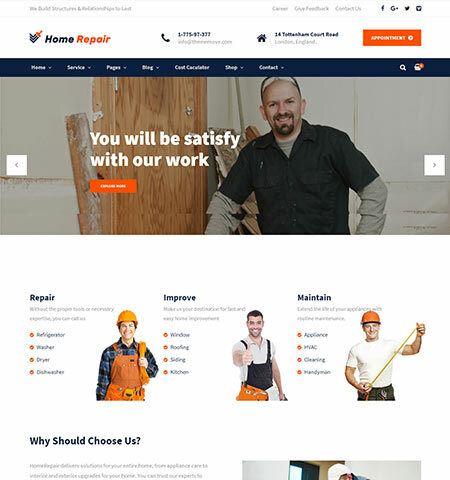 This is an ideal WordPress theme for those people or company who want to build their Home Repair, building and maintains service related website asap. This is fully functional and ready to go with complete demo features. You can call it all-rounder theme also because it has almost everything to build the best construction WordPress website. 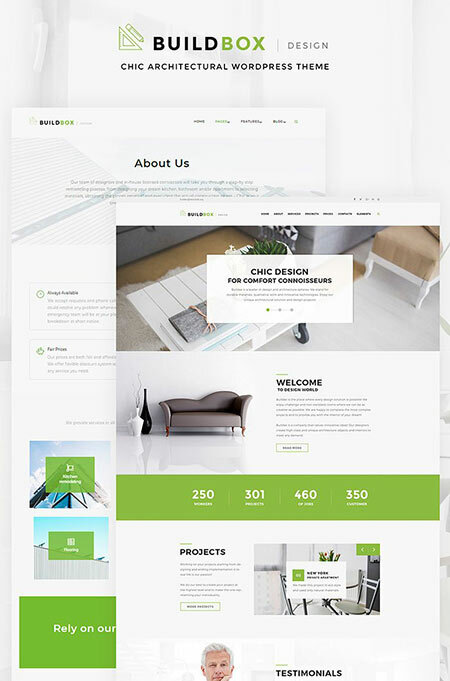 Profitex is a bright architecture agency WordPress theme. It’s a higher standard customizable powerful WordPress themes. It has stunning design and very user-friendly appearance that helps your visitor to navigate your website easily. If you are looking a architecture company WordPress portfolio template then this could be your first choice. This is just awesome and looks perfect for an architecture website. This template comes with useful and most popular Elementor page builder. Using this page builder you can create any type of page on your website with any design. There is no need any coding knowledge. However, it has so many pre-made design template that you can use right away and saves lots of your valuable time. It’s a fully mobile responsive template that comes with some useful nice features for the mobile users. So that every visitor can navigate the page properly and find their exact information. There are lot’s of business industry all over the world. For every single business, the category has their own business website with their various information. 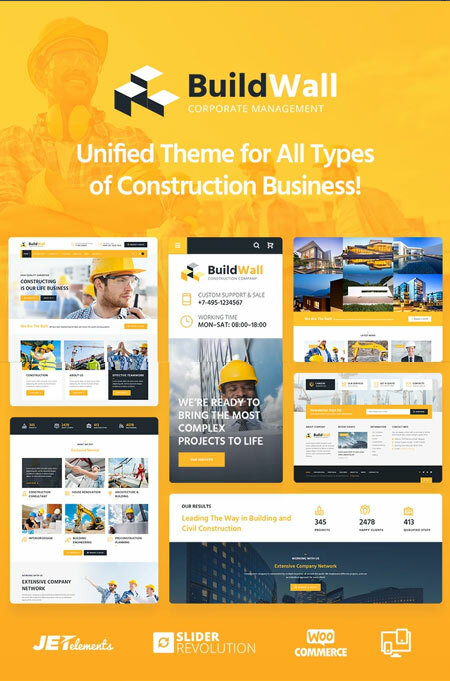 Just like that, Builder builds a completely professional high-quality business WordPress theme and this is built for the construction business purpose. 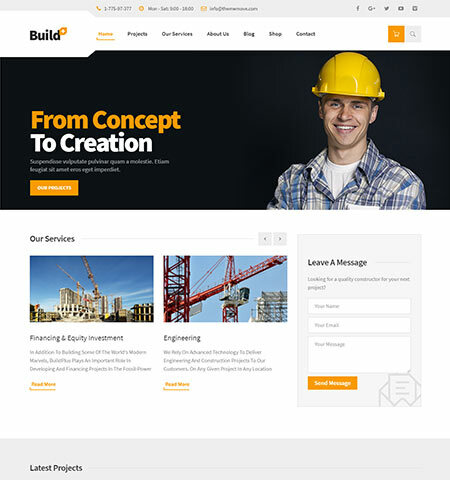 You can use Builder building construction WordPress theme for your construction business. 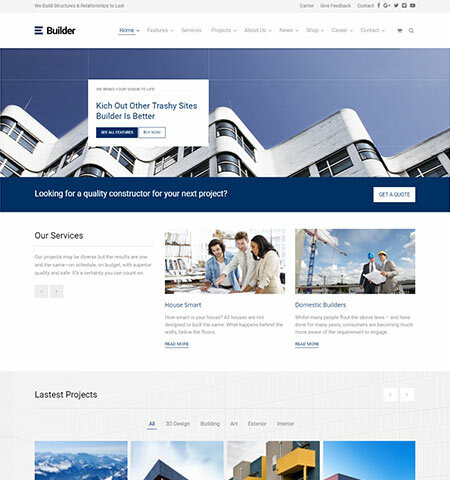 The builder is a fantastic construction WordPress theme that comes with a great support. 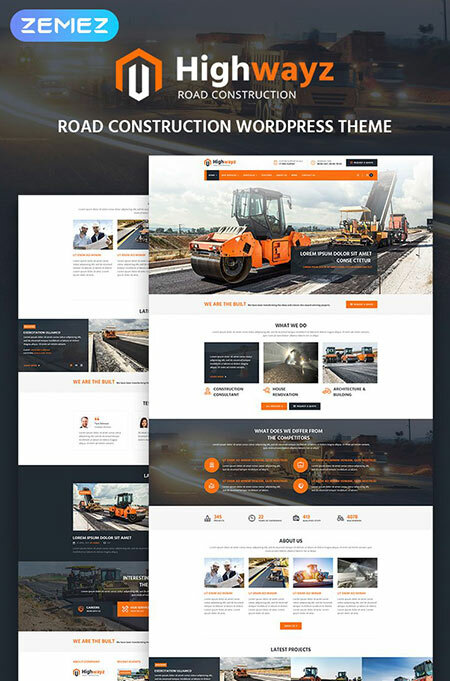 It’s a road Construction portfolio WordPress theme. This template is best for any kind of construction business company. You can use this template for creating your official portfolio website easily. Highwayz comes with a variety of pages and lots of creative design. Every single page comes with a unique eye-catching design that makes it more impressive. It has stylish and lots of astonishing elements for you to customize this template easily. In this template, they use most useful and popular Elementor page builder. Elementor is one of the most popular latest page builders it comes with tons of well design modules! If you look at their demo page then there you will see lots of images. And the great news is you can use those image also for your website. It’s 100%. So you don’t have to buy any stock image for your website. You can use their own images. 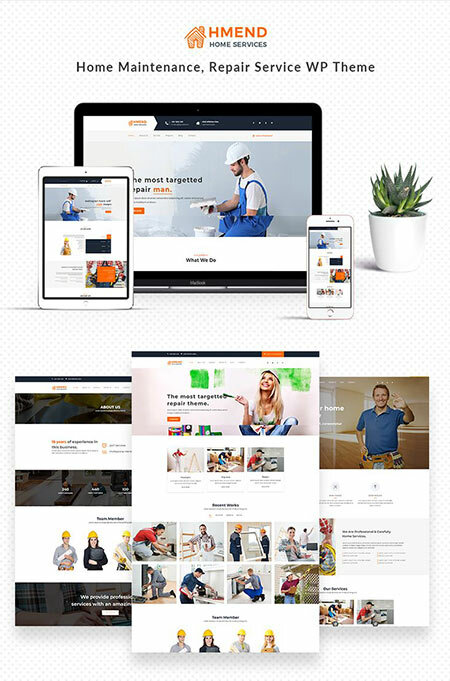 It’s complete construction company Multipurpose WordPress theme. Its a fully responsive and SEO optimized template. BuildWall comes with a hundred of custom elements that help you to do any design on your page. 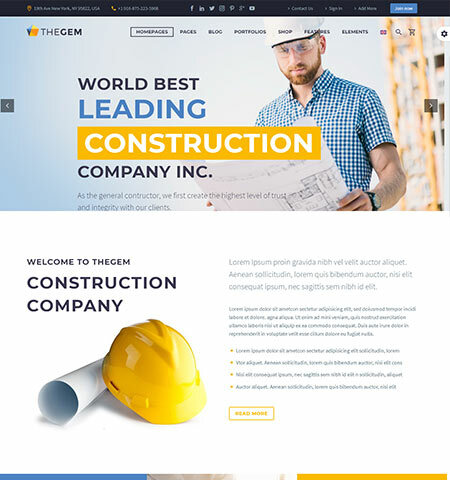 Using this powerful website template you can build Construction website, Architecture website, Business website, Corporate website, Road Construction website, House lifting and moving website, Rent construction, Pool construction, eCommerce shop and many more. With this single theme, you get unlimited features and possibilities. However, there is some good news for the buyer, using this template you will get lifetime dedicated support and update. That’s really impressive. If you want to sell your products through online or your website then no need to create or buy any other website template. Using this single template you can also create online eCommerce shop and sell your own product globally. 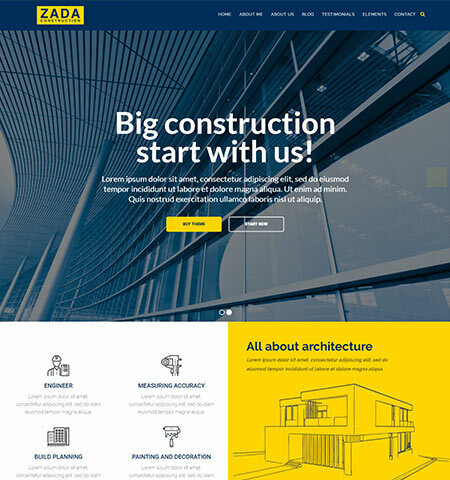 Buildbox is an architecture agency WordPress theme. Its an eye-catching stylish interior website template. Its a complete package for that business owners and company who want to build their own online presence. Its complete solution for any type of agency website. This is a multifunction template and comes with a unlimited various design. Buildbox has a great user interface that helps your visitor to navigate your website properly. However, it’s easy to create your own civil engineering project layout easily and you can customize it any format. Also you can showcase your previous project as a portfolio so that visitor can easily understand and see the previous work that you have done. There is good news for you. If you purchase this theme then you will get lifetime support and lots of free stock images that you can use on your own project. 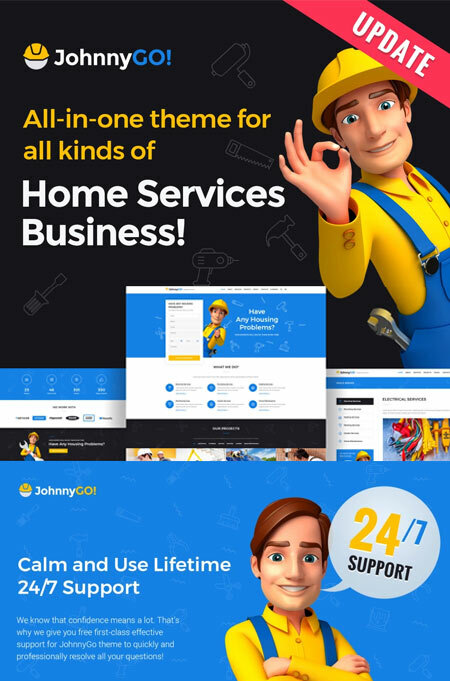 JohnnyGo is a Multipurpose Home Service WordPress theme. However, you can also call all in one WordPress template. Because it has unlimited features that you can use to build your website. It comes with a complete solution for creating any type of Home service business website. It has lots of skins for multiple home service package in this single theme. The designer used top quality design and follow the current website design which is trending in this year. The template UI and UX is super awesome. The user interface is very useful for the visitor. There is nothing to hide and no complex part for the visitor. For this purpose, they understand every part and information that you display on your website. However, this template saves lots of your valuable time and boost your business amazingly. With this theme, you get everything that you might need to run a home service website. And many more unlimited features..
Resiston is a complete industrial Company Elementor WordPress thems. 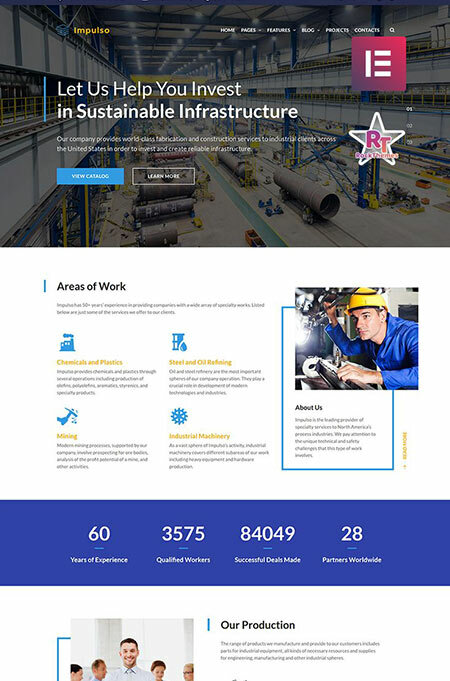 Its a beautifully stylish and modern template this could be one of the best solutions for you to create an industrial website. It’s next-generation WordPress theme and this theme is perfectly suited for any kind of industrial website. This theme is completely responsive and stylish theme that offers you to change any kind of part or section from any page easily. There is lots of freedom for customizing this theme. Resiston has powerful drag and drop website page builder that let you do any kind of design and you are able to change text, image, content easily within few second without any coding skills. With this theme, you will get JetElements addon for Elementor which will helps you to add more features to your website. And they have so many prebuild block and page layout. So every single time you don’t have to create a new page. You can just select any of them from their settings and apply on your page. It just takes less than 5 seconds. Free stock images with the theme demo. 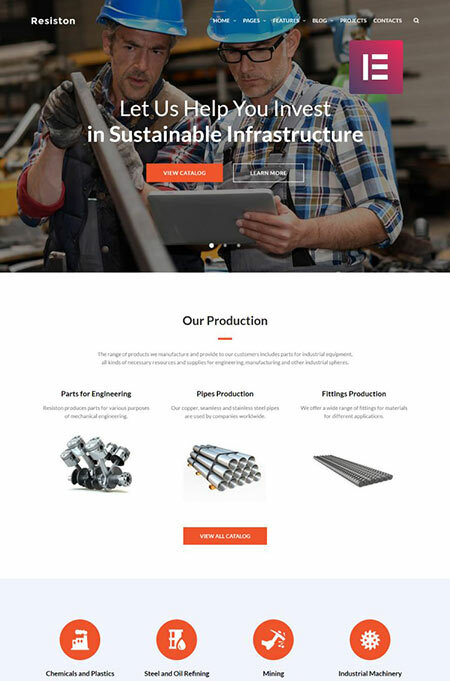 Are you looking a WordPress theme for you build your industrial or construction business website? then you are in the exact place. This template comes with so many unlimited opportunities for the webmaster. You can use highly functional plugins with this theme. There is no limitation. You can use any of plugins for an example: Gallery plugins, Booked appointments plugins, and many other plugins. Using the impulso you will able to add new custom design and manage them easily using their powerful drag and drop page builder. In this theme, they include powerful drag and drop Elementor page builder and at this time this page builder is much popular than any other page builder. Because of its easy customization and great loading speed. new image and so many more blog related features. Live customizer and many more features. 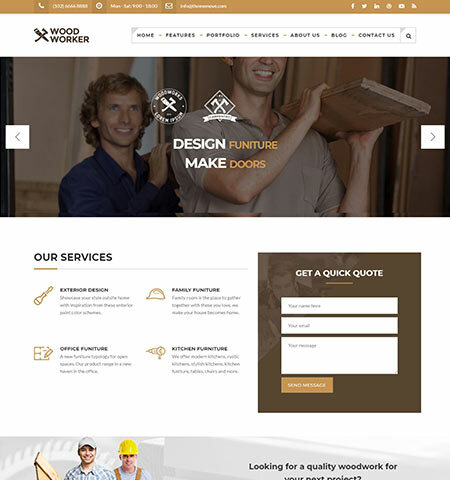 This template is perfect for Home Maintenance and Repair Service website. This template is built with based on most popular and faster Drag and Drop King Composer. Hmend is a fully responsive template with full-width layout and it’s very easy to install and setup. There is more than 3 Homepage version that allows you to start your web page right away and those are complete with very informative and niche related image. That means we can say that it’s come with a complete package you have to just install and setup if properly. It easy to customize and allows you to change header, logo, banner, slider, and anything from any section easily. 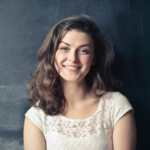 For doing those changes there is no need any previous experience or coding knowledge. Additionally, it comes with a completely unique design and pixel perfect layout. So you don’t have to worry about the design quality. Also, it’s completely validated in W3C. Trowel is one of the most powerful and latest Construction WordPress theme. It comes with several unique features and great functionality that will definitely help you to grow your business. The design quality of this theme is really high and classic look that attract your visitor easily and make them repeat client. This template build with so many different kinds of sections that helps your visitor to navigate your website and find the exact solution what they search. Moreover, you can showcase your latest work or project on your website. This will help your visitor to see the latest project that you have done. This will increase their trust and admire your work. It has some more features that make your more comfortable. They include a fully functional calculator with this theme and so many features that are useful. Trowel is a completely translatable theme you can easily translate this theme any language. Projexon is a Light weight Bright Construction company WordPress theme. It comes with a great useful and colorful section and unique design that makes it more professional. It built with the most powerful and lightweight Elementor Drag and Drop page builder. Also, It has super useful and informative theme option that will help you to add or remove anything like a logo, banner, image, slider, widget, content etc easily. Projexon has great mobile layout features that flexible layout will help your visitor to see your website properly on their mobile device. Nowadays, most of the people use their mobile phone to visit any website. This theme comes with hundreds of demo pages and lots of block elements. It has also mega menu features that let you add more information on the menu bar. This is really a very helpful feature. Free Stock image with the theme. Constructo is a robust and realistic Construction WordPress themes. It has great typography that feels more professional and stylish. You can call it big, better and bolder. They mainly focus on this theme for creating a different kind of construction niches pages using their own built-in element. You can create any kind of construction structure related page using their page element. Using this theme you can be able to get the maximum benefits. Zada is one of the most complete construction WordPress themes that let you create your own construction brand perfectly with proper information. Zada’s visual customization is very easy to use and also the most popular page builder plugin that is called visual composer. It’s easy to install and anyone can manage this theme using WordPress dashboard. They have a great support system. It’s a multipurpose Construction WordPress themes. 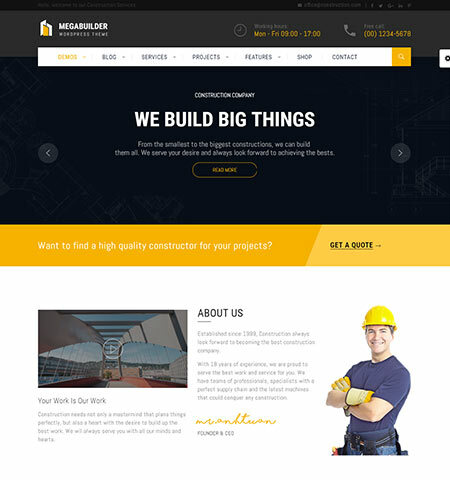 MegaBuilder is a very simple, beautiful and lightweight modern Construction WordPress themes. It’s pretty new on this platform but it has plenty of options to play with this theme module. 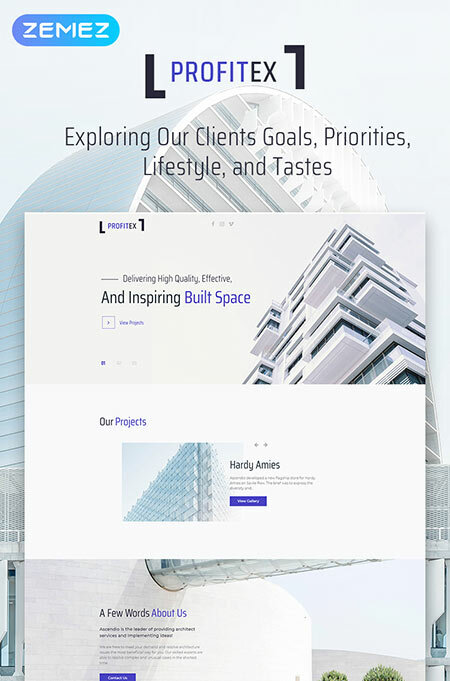 Using this theme you can create interior design website, Architecture website, Building renovation website, Industrial website, Factory or manufacturing website etc. It has unlimited possibilities. You can create awesome looking and highly functional website using the theme. 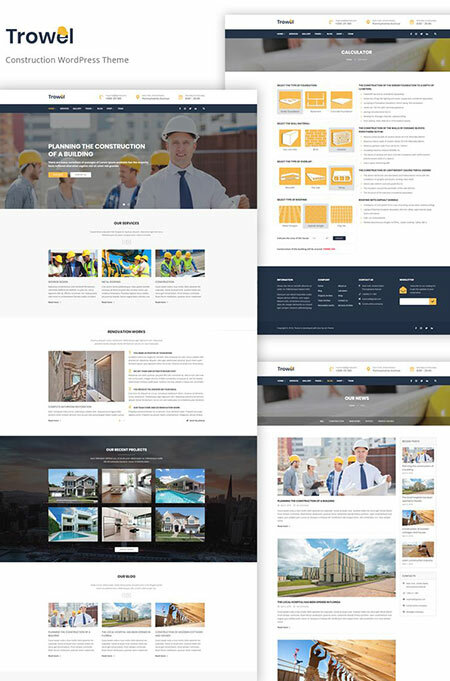 AVXBuilder is a construction business WordPress theme this theme is fully optimized for build a construction website. It has some awesome beautiful highly quality standard premade demos. AVXBuilder is fully mobile responsive and high performance WordPress theme for construction and building website. It’s one of the most beautiful construction and building theme ever. This theme is created by the TheGem Theme they are doing really good. 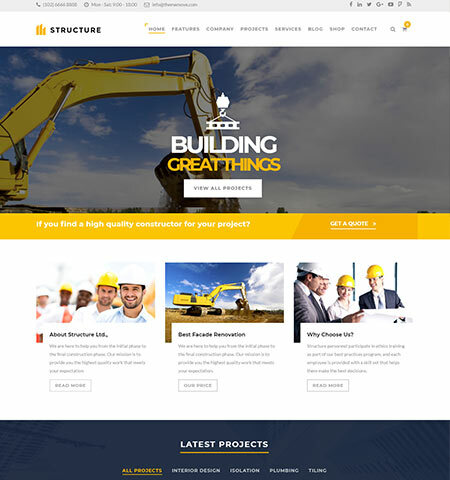 It’s a building and construction company WordPress theme. 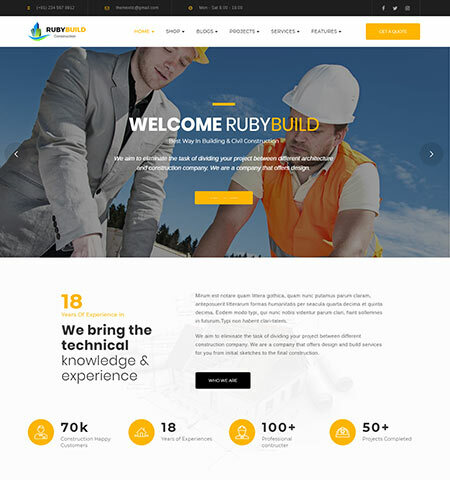 RubyBuild is specially build for the construction company. and dedicated to the other corporate business companies. It comes with a clean fonts and highly professional looking design that makes this theme more stunning and awesome. RubyBuild has plenty of advanced customization options that gives you more flexibility. And some more features are coming soon.. Awesome post.I read your blog. I am very glad to watch your post. this is my first visit to your blog! We are several volunteers and starting a brand new initiative in a community in the same niche. Thanks, Tammy Stay with us for more new WordPress Products review and hosting review on our blog.